THE DAILY PLANET’S OTHER INTREPID GIRL REPORTER! In 1938 Superman’s inauguration into comic books redefined the entire industry – and ushered in the clones. After seeing the sales of the phenomenon that is Superman, other publishers were quick to hop on the bandwagon, and who could blame them? Even a marginal piece of the pie would add up to major cash crops. Among the earliest of such imitators was the wondrous… erm… Wonderman, published by Fox Features Syndicate, owned by one Victor Fox. I’d have to question how long a character dressed in bright red long johns and bright yellow trunks would last, even with all the strength and ability of Superman, but National Periodical Publications, Superman’s publishers, didn’t take the chance and their lawyers quickly stopped Wonderman’s exploits. 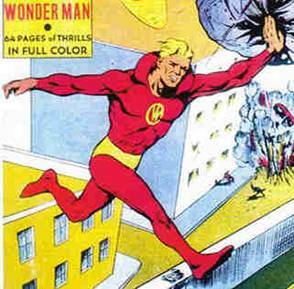 Wonder Comics #1 was Wonderman’s only foray into superherodom, evidently being buried under a wealth of litigation. More powerful than a locomotive? Sure! Stronger than a team of lawyers? Obviously not! So, the moral here is, if you put a team of lawyers up against a locomotive, bet on the legal beagles every time! Run Wonder Man, run! Must… evade… court… subpoena!! Don’t worry though, with his Aryan good looks, blonde locks and uncanny ability to cause mass destruction, I’m certain our boy here was able to find work with the “Reich” folks soon after. I’m sure he and Captain Nazi were great pals. But I digress. Victor Fox would be upset by having his character so promptly removed, and would seek some sort of outlet for revenge. Enter the Blue Beetle and his own, formulaic foil, nosy reporter Joan Mason, of the Daily Blade. However, at some point the Blade seemed to have lost its edge as its name was altered to the Daily Planet. Yes, that’s right, the Daily Planet. The Daily Planet, a newspaper known around the world as the workplace of Superman’s other identity, Clark Kent, and the home of a large chunk of his supporting cast, including editor Perry White, office boy Jimmy Olsen and the love of Superman’s his life, the fearless and danger courting reporter Lois Lane. 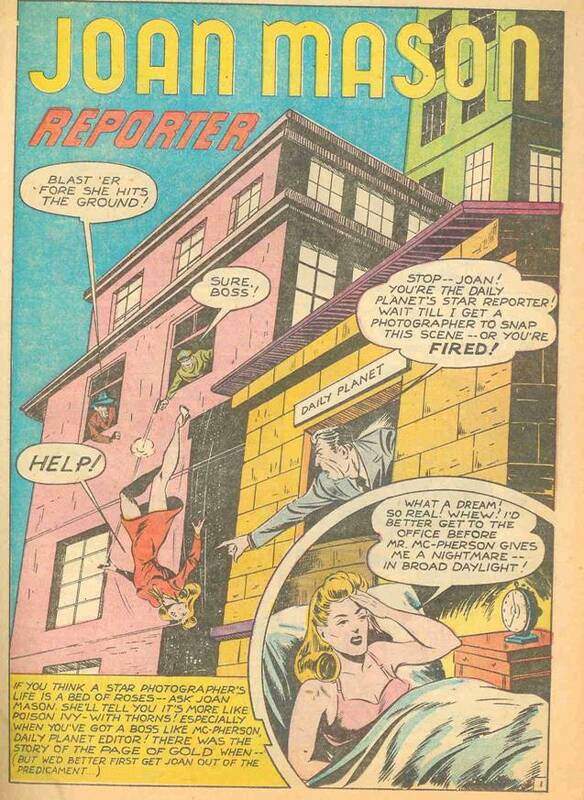 The splash page to the Joan Mason story in Zoot Comics #7 shows our other intrepid reporter finding trouble right away. Zoot #7 is also the first appearance of Rulah, Jungle Goddess. Let’s see, negligees, scantly clad jungle women, yup, it’s a Fox comic book alright! You know what would be interesting, now that DC Comics actually owns the rights to Blue Beetle and in all likelihood, his supporting cast? How about if a Daily Planet branch opened up in the Blue Beetle’s book, featuring Mc-Pherson and Joan. The storylines could just write themselves, just watch! Joan could cross over on a trip to Metropolis and meet her brunette double in Lois Lane. She could then KO Lois in the back room and then start an affair with Superman, having duped Superman into believing she is Lois after dying her hair. Superman, unaware of the substitution of Lois with a perfect replica, is just happy-go-lucky (or is it “happy to get lucky”?). This could lead to a prolonged storyline where Joan gives birth to the future Superman Junior. Upon reaching manhood, Junior, with blonde hair and superhuman talents, dons a red and gold suit and becomes the furious Wonderman (or Wonder Man, whatever catches the bigger demographic)! Angry at his father for never allowing him to use his powers as he saw fit (“Dad, come on, just the X-ray vision! Come on, please! ), Wonder Man would then usurp Superman’s place in the world after a furious Lois (a lot of angry people in this story), recently freed from the back room by Wonder Man, goes insane and stabs the man of steel to death with her kryptonite hat-pin (hey, 20 years trapped in a lead-lined back room will do that to you)! And there you have it – the master plan has come to fruition after 70 years – Fox Features Syndicate is triumphant!!! Reality is, DC Comics continues to thrive with their creations appearing in countless media outlets (movies, TV, books, etc.) and has the umbrella of AOL-Time-Warner for protection and support. And poor Mr. Victor Fox, his legacy is one known by only the freaks and geeks of the comic book world. Always bet on the lawyer. Superman, Blue Beetle and all related characters and stories are TM and © DC Comics 2006.